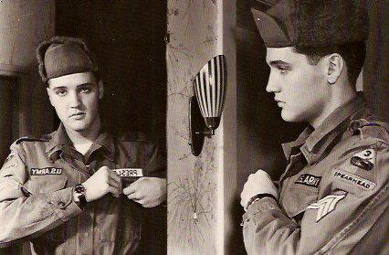 Elvis Presley’s two years in the military after being drafted in 1958 had mixed consequences for his life and career. For his service in the army Elvis earned respect from many of the critics who fiercely condemned him during the early years of his career. Also in the army Elvis met Priscilla Beaulieu, who later became his wife and mother of his only child. But there was also a downside to his military career. He spent the two years in continual dread that during his time away his fans would desert him and that he would be unable to restart his career after his army discharge. Also, it was while stationed in Germany that Elvis began abusing prescription drugs, a habit that would later contribute to his death at the early age of 42. Finding a wife and abusing drugs were not the only significant events in Elvis’s life during his army stint. He went in at the age of 23 and emerged at age 25. When he returned to the public spotlight in 1960, it was obvious that he had matured, both physically and professionally. He no longer was the gyrating rock ’n’ roller he had been when he entered the army. With recordings like It’s Now or Never and Are You Lonesome Tonight? Elvis moved successfully into pop music’s mainstream. He also played a conservative part in his first post-army film, G.I. Blues, forsaking the “angry young man” roles he had played in his first four movies in 1956 and 1957. 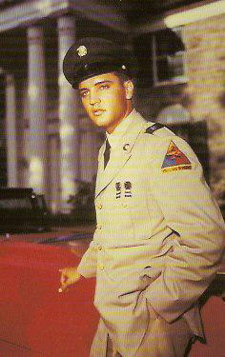 To learn more about the army Elvis, select from among the links below. • Elvis and the Draft: How he became the nation's most famous draftee. • Elvis in Germany in 1959: At the mid-point of his service, it was obvious the army had brought Elvis some unwanted normalcy. • Private Presley: The Missing Years—Elvis in Germany: Andreas Schröer recalls Elvis's military tour in Germany, where he met his future wife and started down the road to prescription drug addiction. • Elvis's Army Job: What if Elvis had been an entertainer in the army? • Rex Mansfield and Elisabeth Stefankiak: Separate relationships with Elvis in Germany brought Rex and Elisabeth together. • Elvis on the Home Front: Fan magazines helped keep Elvis Presley popular at home during his army hitch. • Elvis's Fun-Filled Army Furlough: In June 1959, Elvis and 3 buddies emerged themselves in the night life of Munich and Paris. 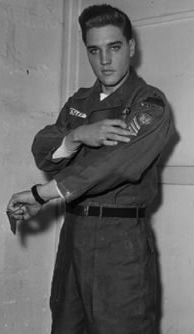 • Elvis's Last Month in Uniform: Important decisions were made then that changed the course of Presley's career. 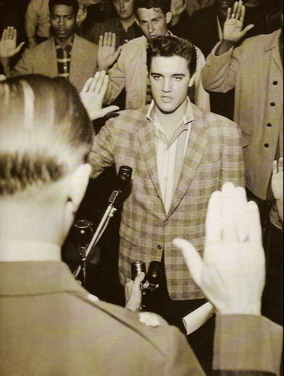 • Elvis's Army Discharge: It just might have been the happiest day in Elvis's life.